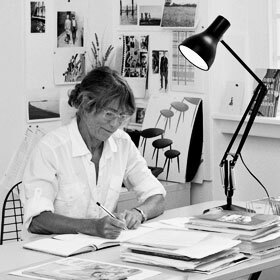 Margaret Howell is a contemporary British clothing designer who started her business from a modest flat in South-East London over forty years ago. After graduating from a fine art degree at Goldsmith College, London in 1969 she began making accessories which came to the attention of Vogue and other fashion magazines, encouraging her to go onto designing clothes. Her London flagship store is also used for staging exhibitions that draw attention to aspects of British design, other than selling her label merchandise. In 2007 Howell was made a Royal Designer for Industry by the Royal Society of Art and was awarded a CBE for services to the fashion industry. In 2010 she was awarded an Honorary Doctorate from University of the Arts London; in 2013, Howell was awarded an Honorary Professorship from the University for the Creative Arts. Margaret Howell is now sold worldwide with flagship shops in London, Paris, Florence and Tokyo and has more than 100 outlets throughout Japan.